Al Gore and Mikhail Gorbachev are in a battle for the control of the .eco domain. The Internet Corporation for Assigned Names and Numbers (Icann), the body that oversees the internet’s structure, decided to make available the “green” domain. Gore supports Dot Eco LLC, while Gorbachev is linked to the Canadian Big Room through Green Cross International, the charity that he founded. Big Room promises to donate a quarter of the sales to environmental and social causes, it is also saying that they will to ensure that it will award a domain name only to groups that provide proof of their green credentials, thus making .eco into a cyber environmental certificate. Dot Eco is promising 50% of their profit to green causes, and it has no defined if they will be vetting any company to get the .eco domain. Note the difference between offering a percentage of sales versus profits. Of course, Gore and Gorvachev do not mention the amount of money that they expect to make with the .eco domain. The price tag is $100,000 USD, but the Daily Telegraph calculates is worth billions. The problem I see with this internet news is the bastardization of the words sustainability and green. The word sustainability has been cheapen down in the media to mean “ecologically friendly”, ignoring the economic and social factors inherent to it. I do not want to start raging again the concept of “green” that neohippies all over the world are spewing guised as knowledge. This is the mob I refer to in my quote, the people that promote green business until big business want to go green, then they will cry foul and hypocrisy. The fact that they do not mention the huge profit they can make from the domain also makes me wonder how innocent the business are. It is OK to make loads of money, but is not OK to pretend all you want is a better world; Sustainability is about BOTH, and the fact that they do not recognise it shows how the leaders become the followers of wannabe good-doers. Who are this companies to decide who is green and who is not? Certain companies are not environmentally friendly by nature, e.g. oil companies, but they are companies like British Petroleum with a CSR and some like Pemex or Shell. A lot of companies, specially organic promoters, lie about the goods of their “green” products. As students of sustainability, we have it hard enough to define which companies are or are not following sustainable practices, we do not need self serving institutions policing the internet, which is the ultimate free expression medium. Could I have someone to relate to? See, I’ve been travellin’, travellin’ forever, and now that I found a home, feels like I’m in Heaven. Anybody that has been in this planet the last fifteen years have heard how the world is getting smaller: Globalisation, global citizenship, the global village, and the flat world. Pundits are announcing the end of the nation-state, the end of the local community, and the upcoming era of the global person. They claim that nationalism is dead, and that ethnicity will only matter in history books. Nicholas Negroponte went as far as stating that nationalism is a disease. There are voices claiming that “The debate on national identities has become obsolete”. As a student of sustainability, it is very important to understand the social fabric of a given society. We target three bottom lines: Economic, Ecological, and Social, and you cannot target the social bottom line with a “one size fit all” culture that the Western in general, and the United States in particular, pretend to impose. Legions of immigrants come to Europe and Angloamerica, and they integrate, and they prosper, and for some, nationalism is a matter of the past, since they want to belong to their new home. But for every successful immigrant, there may be another ten who did not prosper, and there are thousands who are still in the homeland, keeping their own culture alive. Americans also find ethnonationalism discomfiting both intellectually and morally. Social scientists go to great lengths to demonstrate that it is a product not of nature but of culture, often deliberately constructed. And ethicists scorn value systems based on narrow group identities rather than cosmopolitanism. But none of this will make ethnonationalism go away. Immigrants to the United States usually arrive with a willingness to fit into their new country and reshape their identities accordingly. But for those who remain behind in lands where their ancestors have lived for generations, if not centuries, political identities often take ethnic form, producing competing communal claims to political power. The creation of a peaceful regional order of nation-states has usually been the product of a violent process of ethnic separation. In areas where that separation has not yet occurred, politics is apt to remain ugly. Nationalism leads to wars. In Europe, after the conflicts of 1914 and 1939, a web of transnationals institutions were created, first to integrate Germany in a trade-dependent Europe, then to resist Soviet pressure, and finally to become a supra-state. Educated Europeans and North Americans like to think that nationalism is behind and that the globe is now a village. However, for the thousands of Latin Americans, Asians, and Africans who die every year trying to reach the promise land, the frontiers are not so open. In 1900 there were many states in Europe without a dominant nationality, by 2007 there were only two: Belgium is close to break up, and Switzerland, where the domestic ethnic balance of power is protected by strict citizenship laws. We also have Canada, where the ethnic division between French and English is a constant burden to Canadians. Ethnonationalism has played a larger role in modern history than is commonly understood. Look at the post cold-war conflicts: Yugoslavia, Rwanda, the partition of Czech and Slovaks… Some places inside the Francophony only welcome francophone immigrants, and even in cities like Toronto, they are huge areas where people from one ethnicity dwell. There are two ways of thinking about national identity. One is that all people who live within a country’s borders are part of the nation, no matter their origins. The other one is ethnonationalism, which defines a nation as a shared heritage, a common language, a common faith, and a common ethnic ancestry. Québec was recently recognised as a nation by the Prime Minister of Canada. Ethnonationalism draws much of its emotive power from the idea that the members of a nation are part of an extended family, ultimately united by ties of blood. It is the subjective belief in the reality of a common “We” that counts. The end of the British mandate of Palestine created Israel, where two ethnics, Jews and Palestinians. Israel has been unable to live in peace for 61 years. The independence of Algeria saw the end of the Algerian-European ethnic, which was forced to go back to Spain and France. In Sudan, a civil war between the Islamic North and the Black South is still hot. We, as promoters of sustainability, need to take the idea that nationalism is dead into serious consideration. The worlds elite, that probably includes all my readers (Westerns with access to internet and an interest about social issues) and fellow bloggers, belongs indeed to a supranational, non-ethnic world, but for each of us there are thousands and thousands who still believe that they only be home when everybody look like them. Take me to a place where they look like me. Strive for perfection in everything you do. Take the best that exists and make it better. When it does not exist, design it. This blog is about sustainability. We can define sustainability as the right balance of a triple bottom line: Economic profit, social profit, and environmental profit. I have been focusing in the environmental profit because it is the one that is more urgent to address; the other two can be closely related (social and economic development can go hand by hand) but usually the environment receives all the cost of this development. Some people have not yet realised the long-term effects of a raise in average temperatures. Some people do not even recognise that Global Warming exists. Unlike other pollutant, CO2 remain in the atmosphere for hundred of years, while is reabsorbed at a very slow pace. Victor, Granger Morgan et al compare the emission-reabsorbsion problem as having a bathtub with a huge faucet but a very small drain. The only way to reduce the amount of greenhouse gasses is to dramatically reduce the size of the faucet, but whatever measure we may take in reducing the greenhouse gases emissions, the result will come decades later, hence the urgency to take measures now. The United States has been incapable to even cap their emissions, let alone reduce them. China has surpassed the USA as the main greenhouse gases producer, and the developing countries are just not going to stop producing the relative cheap fossil energy. While efforts need to continue to reduce CO2 emissions, we need to try to reverse the effects. Geoengineering could provide a useful defense for the planet, an emergency shield that could be deployed if surprisingly nasty climatic shifts put vital ecosystems and billions of people at risk. Geoengineering is not a new idea, since the 1940s the USA and the Soviet Union experimented in seeding clouds to make rain and to reduce hurricanes power (with very poor results). Volcano eruptions, like the one in Philippines in the early 1990s, reflected so much sunlight that global temperatures dropped 0.5C in less than one year. It works like this: 70 percent of the earth’s incoming sunlight is absorbed while the remainder is reflected back into space. Increasing the reflectivity of the planet (known as the albedo) by about 1% could have an effect on the climate system large enough to offset the increase in warming that is likely over the next century as a result of a doubling of the amount of CO2 in the atmosphere. This is easier than causing rain in a particular location because it is not a fine tool: it is a blunt instrument that affects the whole planet, and that is exactly what we want. Geoengineering techniques are divided in two: Removing the CO2 (e.g. fertilizing the ocean with nutrients that would allow plankton to grow faster and absorb more carbon, or scrubbing the air with cooling towers) and increasing the earth’s albedo. The latter are more promising: one kilogram of sulphur placed in the stratosphere would offset the warming effect of several hundred thousand kilograms of CO2, or seeding bright reflective clouds by blowing seawater into the lower atmosphere. “There is a general agreement that the strategies are cheap; the total expense of the most cost-effective options would amount to perhaps as little as a few billion dollars, just one percent (or less) of the cost of dramatically cutting emissions”. This do not offset the importance of reducing C02 emissions, since reflecting the sun light does not reduce the already dangerous C02 concentration that is ending up in the oceans, killing coral reef and creating maritime dead zones. Altering the albedo will have some consequences, like changing the rain patterns (as learnt during volcanic eruptions), but the difference is that we can stop increasing the albedo, since Geoengineering requires constancy, Global Warming effects are, in the other hand, long term, and far more dangerous. When you have Cancer you undergo chemotherapy, but you also take painkillers. Chemotherapy is the cure, is expensive, uncertain, and long term. Painkillers are a temporarily measure, cheaper, reasonably predictable, and a short-term solution. You need both to get cured, similarly, just trying to lower our present emissions is expensive, uncertain, and many nations just do not care. It needs to be done for sure, but in the meantime, they are options to reduce the risk and effects of Global Warming. Furthermore, it only takes one powerful, decided nation to conduct a Geoengineering experiment. The literature and the scientifics studying this discipline is scarce, and further study may reveal that Geoengineering is just too dangerous; messing with the atmosphere is surely to be a shocking idea for the most of us, but we have already engage in a dangerous Geoengineering experiment by pumping massive amounts of CO2 into the atmosphere. The best and safest solution is to stop greenhouse gases emissions, but this will take time and consensus among countries with very different political and environmental views (remember, it is China and the USA talking about deep economic changes) As with particles accelerators, nanotechnology, and genetic engineering before, it is time to set regulations and rules to explore the idea that one day, the nations of the world may need to erect a shield to protect our mother land. They say it is better to be poor and happy than rich and miserable, but how about a compromise like moderately rich and just moody? The neo-Malthusians had their origins in the late 1960s and early 1970s, when books like The Population Bomb (Paul Ehrlich) and The Limits to Growth (the Club of Rome) were published. Their main premise was different than Malthus’s doomsday omen, it was more focused on environment degradation: The richer people get, the worse things become for the earth. When Goklany sees progress everywhere he looks, the neo-Malthusians see impending disaster: air pollution, the disappearance of habitats, the emptying of aquifers, the demolition of forest cover, and the proliferation of new diseases. Goklany sees us advancing toward progress, the neo-Malthusians see us advancing directly to the rift. This means that technological change has a multiplier effect on population size and the wealthiness of the population, so we need to place strict limits on human behaviour. 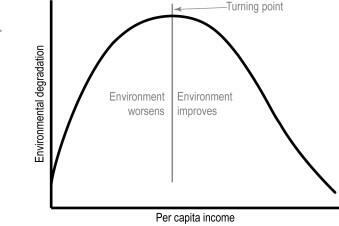 There is some logic on this theory: “As societies get richer and more populous, they do consume more resources, and, especially in the early phases of economic growth, they do so with a measure of indifference to the overall impact on the environment”(J. Surowiecki). But the flaw in the equation is that technology can also reduce environmental impact. In the past 40 years, productivity gains have dramatically reduced the environmental burden of farming and shrunk the amount of land needed to feed the world. Technological improvements in the scrubbing of power-plant smokestacks have brought a sharp reduction in the amount of sulfur dioxide in the air. Improvements in the efficiency of wind and solar power have reduced (a least at some extent) the demand for fossil fuels. Technological change is actually the result of increased affluence, which makes it likely that an economy will get cleaner even as it gets richer, Goklany explains that “developed countries do generally have cleaner air, cleaner water, more forest cover, and less cropland devoted to food production than developing countries do, even though the latter are much poorer”, with the exception of CO2. Goklany even suggest that richer countries open the path to poorer ones, since the invention and spread of new technologies make it easier and more likely for countries to get on the right side of the U-curve quickly, even before they have become rich; the “green revolution,” for instance, allowed poor countries to reduce the environmental burden of farming. The turning point of the EKC will be when PAT1<T2. Different pollutants may have different EKC since some pollutant’s effect are more obvious, and that could explain why greenhouse gases emissions are not yet in decline: their long-term effect is less obvious that a chimney spewing coal. Ask not what the government can do for you. Ask why it doesn’t. 1) Promote the use of smaller cars, tax the Hummer and the nine seats SUV, do something, stop the madness of bigger, gas guzzling transportation. 2) Get Real with Public Transit System. Do not promote it based on good intentions, people won’t wait 45 minutes for the bus, neither will pay big bucks for bad services. Control cost of public transit and maintenance, keep the transit affordable so people will really prefer it over using the car. I had to buy a car because it was taking me two hours each way from home to work, while with the car it took me 35 minutes. 3) Control Suburbia. 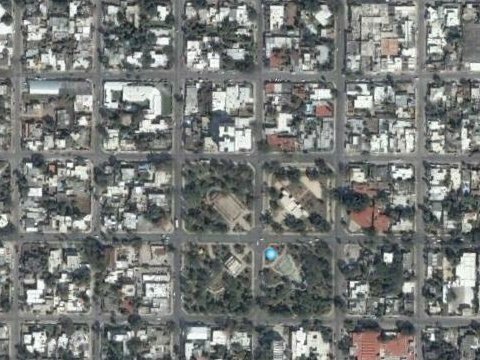 I do not agree with politic leaders taking about making denser residential areas to reduce the size of the city. For some politics easy street means having everybody living in condos, and then they call it the city of the future. No thank you, if you want your house with a front yard, back yard, side paths and a river close-by, go for it, but stop making suburbia streets looking like a spiderweb. Public transit need straight streets to be viable, and private cars need them for having options when commuting. 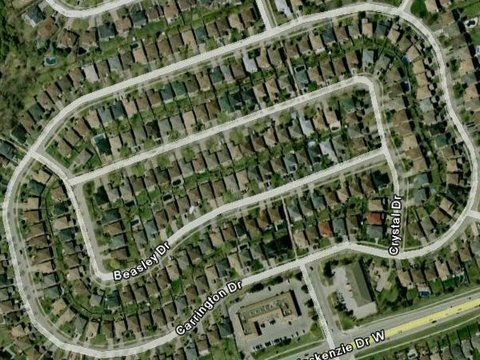 Suburbia is plagued with thousands of cul-de-sacs that feed over used main roads, that are always in traffic jam because you have one or two options for getting out of the neighbourhood: Can you drive a bus here? Which pattern should we encourage? 4) Stop subsidizing easy solutions, like corn-based ethanol. Promote the use of smaller cars, build efficient roads, spend money in real public traffic needs, not in pleasing greedy unions. 5) Enforce traffic law for automobiles, but also for bicycles and pedestrians. Automobiles running yellow lights and making turns where they can’t create traffic jams, but bicycles running red lights and no making the four-way stop also create traffic jams. Pedestrians abusing the right of way, crossing on already stop-signals create a lot of traffic because the lights are designed to accommodate both pedestrian and automotive traffic; pedestrians abusing the right of way just cause more traffic jams by preventing vehicles’ left and right turns. All these alternatives are going to affect our lives, but they for sure will create a more green environment where pedestrians, cyclist, and drivers will be better of. No matter how dark the world becomes, the darkness can never extinguish the light. I had written two post trying to convince you that corn-based Ethanol will have a huge impact on the way third world people live and eat, and reading some of your comments in this blog and in several forums, I feel compelled to write a final exercise. I had to cut it in two parts because it was quite long, so this is the first part. 1) Consume Local Produce. If you live north of parallel 40°, getting all those tropical fruits to your table is burning gasoline and turbosine. Try to discover the local flavours, you do not need to give up your bananas and kiwis, but maybe try the local berries and apples. Buy local tomatoes and potatoes instead of organic, long-hauled products. 2) Park the Car. Enough of driving to the corner store, walk, bike, use public transit if possible. It is not always possible, but if you reduce your car use by merely 10% the effect in traffic and pollution, as well as in your budget, will be noticeable. 3) Recycle, Reuse, Reduce. I know it is wheat grinned, but say not to plastic bag; carry your own bag, c’mon, you know you want people see you carrying that big bag with a photo of Earth and the legend ‘Love it or Leave it’, they sell them in the hippies stores, go get one. If Subway is wrapping your sandwich in more than one layer, stop them and ask them to give you only one, or any, you are going to eat it now anyways. 5) You know better than anybody what can you do, so get informed about your situation. If you are already being provided with hydroelectricity, changing your bulbs may have zero impact on the environment. If your town does not provide recycle for metals, try to reuse them. Baby seat is old or in an accident and need to dispose of it? Take it apart, recycle the plastic bulk, reuse the metal parts if possible, and use the fabric as paddings for something, or make a cat toy with them. Almost all non recyclable goods have some recyclable parts. 6) Stop drinking bottled water. It is just silly to pay from $0.80 to $6.00 for a bottle of stalled water that, many times, comes from the municipal source, meaning, bottled tap water. Municipal tap water get tested many times during the day, your bottled water does once, when is bottled, and then let stall. If the flavor of tap water bothers you, get a filter. If the tap water of your town is not potable, buy purified water from those 20 lt, reusable containers, they are cheaper and they do not pollute. In Canada, 85% of water bottles end up in the land field. Bottled water, unless specified from Spring source, comes from municipal sources -tap water-, so you are paying several times for what you get from your sink. Pepsi’s Acuafina is just filtered tap water, as many others. Read Evian backwards, that is what it means to drink this expensive, unnecesary product. I wrote some time ago about how the increasing use of ethanol was damaging the economy of the poor in Latin America, with little benefit for the environment. The rise of corn prices, driven by the excessive demand, increased the price of corn and other staple foods, and make them harder to afford for the more vulnerable citizens. C. Ford Runge and Benjamin Senauer just published an article in the May/June issue of foreign affairs that expand on this problem. There were 110 ethanol refineries in operation in the United States at the end of 2006. Many were being expanded, and another 73 were under construction. When these projects are completed, by the end of 2008, the United States’ ethanol production capacity will reach an estimated 11.4 billion gallons per year. President George W. Bush called on the country to produce 35 billion gallons of renewable fuel a year by 2017, nearly five times the level currently mandated. The push for ethanol and other biofuels has spawned an industry that depends on billions of dollars of taxpayer subsidies, and not only in the United States. In 2005, global ethanol production was 9.66 billion gallons, of which Brazil produced 45.2 percent (from sugar cane) and the United States 44.5 percent (from corn). Global production of biodiesel (most of it in Europe), made from oilseeds, was almost one billion gallons. Filling the 25-gallon tank of an SUV with pure ethanol requires over 450 pounds of corn -which contains enough calories to feed one person for a year. By putting pressure on global supplies of edible crops, the surge in ethanol production will translate into higher prices for both processed and staple foods around the world. Biofuels have tied oil and food prices together in ways that could profoundly upset the relationships between food producers, consumers, and nations in the years ahead, with potentially devastating implications for both global poverty and food security. In the United States and other large economies, the ethanol industry is artificially buoyed by government subsidies, minimum production levels, and tax credits. High oil prices over the past few years have made ethanol naturally competitive, but the U.S. government continues to heavily subsidize corn farmers and ethanol producers. Direct corn subsidies equaled $8.9 billion in 2005. With the price of raw materials at such highs, the biofuel craze would place significant stress on other parts of the agricultural sector. In fact, it already does. In the United States, the growth of the biofuel industry has triggered increases not only in the prices of corn, oilseeds, and other grains but also in the prices of seemingly unrelated crops and products. The use of land to grow corn to feed the ethanol maw is reducing the acreage devoted to other crops. Food processors who use crops such as peas and sweet corn have been forced to pay higher prices to keep their supplies secure — costs that will eventually be passed on to consumers. Rising feed prices are also hitting the livestock and poultry industries. According to Vernon Eidman, a professor emeritus of agribusiness management at the University of Minnesota, higher feed costs have caused returns to fall sharply, especially in the poultry and swine sectors. If returns continue to drop, production will decline, and the prices for chicken, turkey, pork, milk, and eggs will rise. A number of Iowa’s pork producers could go out of business in the next few years as they are forced to compete with ethanol plants for corn supplies. Ethanol and biodiesel are often viewed as environmentally friendly because they are plant-based rather than petroleum-based. In fact, even if the entire corn crop in the United States were used to make ethanol, that fuel would replace only 12 percent of current U.S. gasoline use. Soybeans and especially corn are row crops that contribute to soil erosion and water pollution and require large amounts of fertilizer, pesticides, and fuel to grow, harvest, and dry. They are the major cause of nitrogen runoff. Nor is corn-based ethanol very fuel efficient. Debates over the “net energy balance” of biofuels and gasoline have raged for decades. Corn-based ethanol appears to be favored over gasoline, and biodiesel over petroleum diesel — but not by much. Scientists at the Argonne National Laboratory and the National Renewable Energy Laboratory have calculated that the net energy ratio of gasoline is 0.81, a result that implies an input larger than the output. Corn-based ethanol has a ratio that ranges between 1.25 and 1.35, which is better than breaking even. Petroleum diesel has an energy ratio of 0.83, compared with that of biodiesel made from soybean oil, which ranges from 1.93 to 3.21. (Biodiesel produced from other fats and oils, such as restaurant grease, may be more energy efficient.) Similar results emerge when biofuels are compared with gasoline using other indices of environmental impact, such as greenhouse gas emissions. The full cycle of the production and use of corn-based ethanol releases less greenhouse gases than does that of gasoline, but only by 12 to 26 percent. The production and use of biodiesel emits 41 to 78 percent less such gases than do the production and use of petroleum-based diesel fuels. Using gasoline blends with 10 percent corn-based ethanol instead of pure gasoline lowers emissions by 2 percent. Likewise, diesel containing 2 percent biodiesel emits 1.6 percent less greenhouse gases than does petroleum diesel. On the other hand, biodiesel can increase emissions of nitrogen oxide, which contributes to air pollution. In short, the “green” virtues of ethanol and biodiesel are modest when these fuels are made from corn and soybeans, which are energy-intensive, highly polluting row crops. One root of the problem is that the biofuel industry has long been dominated not by market forces but by politics and the interests of a few large companies. Corn has become the prime raw material even though biofuels could be made efficiently from a variety of other sources, such as grasses and wood chips. The World Bank suggests that caloric consumption among the poor declines by about half of one percent whenever the average prices of all major food staples increase by one percent. When one staple becomes more expensive, people try to replace it with a cheaper one, but if the prices of nearly all staples go up, they are left with no alternative. If the prices of staple foods increased because of demand for biofuels, the number of hungry people in the world would rise by over 16 million for every percentage increase in the real prices of staple foods. That means that 1.2 billion people could be chronically hungry by 2025. The world’s poorest people already spend 50 to 80 percent of their total household income on food.